Talk radio has become big business in the last decade and a half, particularly conservative talk radio, which has seen an explosion in popularity and influence. Progressive talk radio? Not so much. San Diegans have become accustomed to the conservative stylings of locally owned 760 KFMB and the not so locally owned KOGO 600. When you’re looking for news in this city, there are no other choices. You’re stuck with the nonsensical, anti-government, sensationalist, and sometimes maniacal ramblings of Rush Limbaugh and Roger Hedgecock. But that wasn’t always the case. For a brief while, San Diego did have a progressive talk radio station to call its own: 1360 KLSD (for “Liberal San Diego,” as we are informed by radio and television news personality Bree Walker). KLSD at one point was the home of San Diego personalities like Stacy Taylor and Jon Elliott. It was also San Diego’s home to Air America Radio, the national syndication outfit that brought voices such as Ed Schultz, Rachel Maddow, Randi Rhodes, and Al Franken, now a United States Senator from Minnesota, to the airwaves. And the station, despite some limitations, and despite being hampered by a weak signal that didn’t reach the entirety of San Diego County, was doing quite well and continued to grow. “I beat Hannity” in San Diego, said Ed Schultz, now a host on MSNBC in addition to his daily radio show. 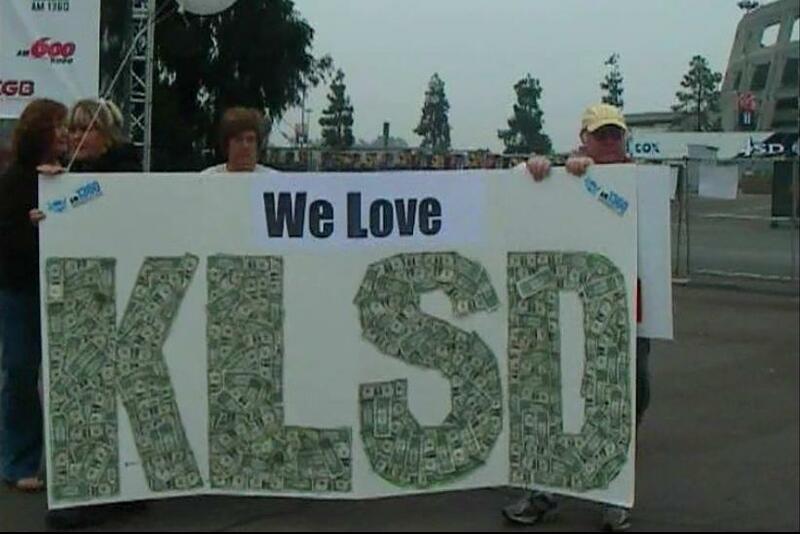 According to Cliff Albert, the KLSD program manager in 2007, KLSD ranked number one in San Diego in time spent listening—the average amount of time a listener would actually tune in to the station without changing the dial. For the remainder of this story, please visit the San Diego Free Press. in the area. I think I have some pictures of some of those protests but CLEAR CHANNEL would not back down and put it back on the air. When we found they had substituted the station with a sports station we knew we had lost the battle. Every since that time I find it hard to listen to radio stations airing from San Diego. A friend (?) told me that I should stop my bitching and start listening to Rush so I could find out what was really going on. Perhaps if we had a more objective station San Diego, in all its finery, would not have elected a “birther” to the court. I’m ready to start campaigning for a return of KLSD. I’m with you, Judi. I really miss Al Franken and Ed Schultz esp.. NPR has some oka ysegments but not enough which is why we need a progressive station all day long. Facts were given, and comments made to get you to think about what was said and find out more if you wanted to. And according to Cliff Albert, there were longtime listeners, but the span didn’t reach out to enough people to hear the program. I heard Cliff Alpert (or Albert) say the same thing about not getting enough listeners to purchase the items touted on the program. But I also heard executives from Clear Channel say that that was not why it was terminated. Rather, they just didn’t want the liberal standpoint aired on their channel. I think that Cliff spouted the party-line until it was apparent there was no hope for a return. After looking at my pictures of Bob holding up a protest sign, it looks like KUSI covered the protest fairly well. Sure would like to hear some of those old commentators now. I truly think that they helped mold my ideas. The passion of its listeners does not determine radio success. If you can’t sell ad time because the number of listeners is low and they don’t spend money on products promoted in the ads, the station will fail. We have PBS for those that have a hard time understanding how the economy works. I am quoting my own post in the SD Free Press. KLSD was taken out right before the election for political purposes. It was a concerted attack by Clear Channel and they did it in as many markets as they could. This movie, 4 years in the works, documents it very well. The movie goes even further than just our local station, there is a brief history of the FCC and how it was politicized beyond belief during the Bush years. Progressive talk radio can still be heard in San Diego (barely) from KTLK AM 1150 in Los Angeles. The signal is very weak and only comes in during daylight hours. The station is owned by Clear Channel’s subsidiary, Citicasters. Pacifica Radio’s listener supported KPFK from Los Angeles can be heard in San Diego from a repeater at 93.7 FM on Mt. Woodson. The signal is very weak in Ocean Beach, but it is the best we have. KPFK’s powerful direct signal has been jammed for years by two different Tijuana stations. The group Activist San Diego is building a new radio station in San Diego, KNSJ 89.1 FM. I have high hopes for this new station.